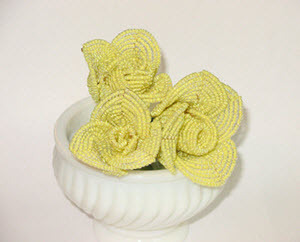 The largest selection of beaded flower patterns on the web! Click here for this free article! 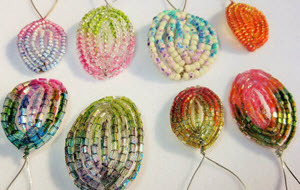 Suzanne shares a wealth of knowledge based on her research into painting beaded flowers. Diane Baron offers a pattern for Delphinium or Larkspur which is the birth month flower for July. Feelings of open heart and ardent attachment are attributed to it. It is native throughout the Northern Hemisphere and also on the high mountains of tropical Africa. This would also look beautiful done with Swarovski Crystals (or Fire Polish for a less expensive version). Included are instructions for the traditional center and 2 new methods.